Creative Learning Center, established in 1976, is committed to providing high quality early childhood education programs, as well as offering a rewarding professional work environment for highly qualified, experienced, dynamic staff. Under the director of the Program Director, teachers work in an open classroom environment, and together with a team of teachers, implement a program for children that is age appropriate, nurtures the development of the whole child, and is consistent with the school's philosophy. HOURS: Monday - Friday 5 to 8 hours. Very competitive pay, commensurate with applicants background and experience. + PTO. 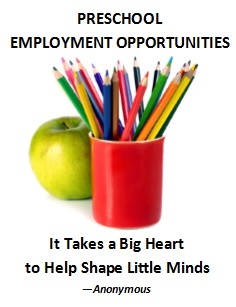 A combination of formal education and experience that enables the applicant to fulfill the responsibilities on the Job Description.. A minimum of 6 ECE units and previous experience working in an ECE setting is required. 1. What are the most important elements of a quality ECE program? 2. Why is this position a match for you?